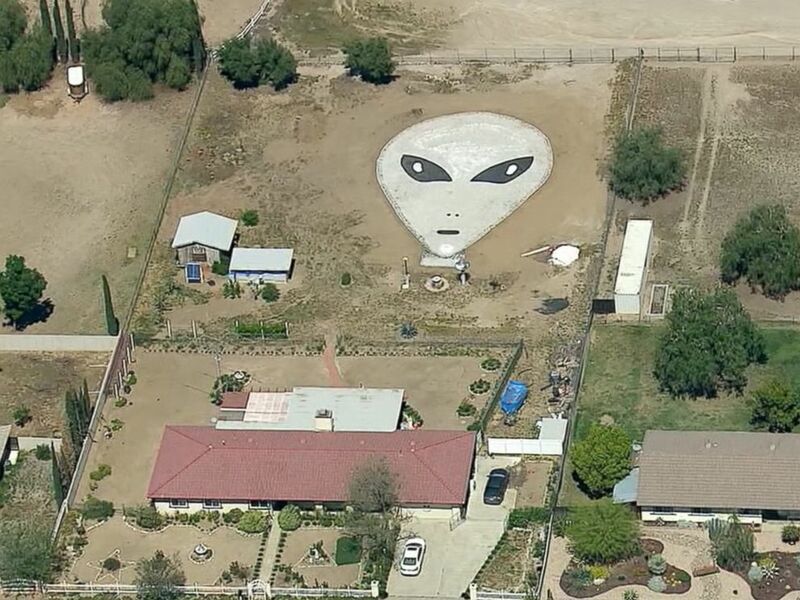 A 77-year-old man in Romoland, California, said he and his family have created a massive alien face in his backyard "in hopes of inviting aliens" to his home. Work on the 60-foot-by-90-foot "rock garden" started this past Monday and was finished by Thursday afternoon, according to Larry Decker, who said he's been fascinated by the idea of extraterrestrials nearly his whole life. "Aliens watch everything we do," Decker told ABC News today. "My idea was to build this thing big enough to be seen from up there, and hopefully, they'll decide to come down and check it out." He added that he has "cameras set up all around his house" and that he hopes the rock art will "attract UFOs" that he can then catch on video. Larry Decker, 77, said he and his family created a 60-by-90 alien face out of rocks in his backyard in Romoland, California, "in the hopes of inviting aliens" to his home. "Wouldn't it be nice to go to the porch swing and have a nice chat?" Decker said. "So hopefully this face will trick them to come, so we can shake hands and talk."